"Officials have yet announced a reason for Wilson's dismissal, but a former Hoosiers player told ESPN that he and at least five current IU players were interviewed about Wilson's treatment of players in meetings with athletic department officials and university lawyers during the past two weeks." Chantel Jennings and Mark Schlabach are reporting that the father of a player who had suffered a concussion during preseason practice in 2015 was "rushed back to workouts" a week following the injury, and that his symptoms began to intensify soon afterwards. A press conference has been scheduled by the school for 6:00 PM Thursday. 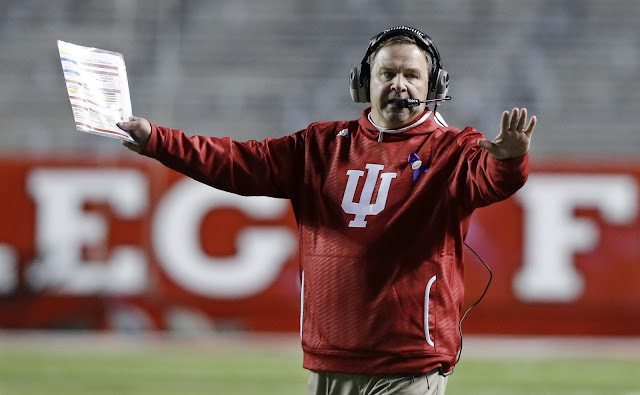 Wilson was hired by Indiana in 2011. His record was 26-47 during his six seasons as the Hoosiers head coach. Indiana finished the 2016 college football season with a 6-6 record, and qualified for a postseason bowl.